In most years February in the Mogollon Highlands of Arizona is still a very quiet time, when mammals, birds, reptiles, insects and plants remain quiescent, waiting for the combined cues of increased day-length and higher temperatures to end their winter diapause and begin searching for mates and food. But in all years the first glimmerings of spring’s vivacity begin this month in the deserts and the chaparral of our region. Over the next several months, the activity in the lowlands will grow from a hum to a roar, and gradually flow up the slopes and into the highest mountains, carpeting the whole of the Mogollon Highlands with flowers, warblers, and butterflies. But for now the uplands remain relatively quiet, leaving the naturalist to search for hints of spring. Bird migrations begin to pick up steam now, as overwintering species such as northern goshawk and Townsend’s solitaire begin the months-long journey that will ultimately end in their breeding grounds, as far north as the Arctic Circle. Other species migrate through our region to points nearer to the north. The last of these migrants will include the neotropical migrant warblers who have spent the winter in the rainforests and dry forests of Central America, and will breed and nest here. The overwintering waterfowl on Willow and Watson Lakes, as well as the many smaller bodies of water will stay in our region for a while yet, since they need to wait for the lakes to the north to thaw before migrating. A very small number of insects and their relatives begin to wake from their short winter torpor in February. On sunny days, mourning cloak butterflies (Nymphalis antiopa) begin claiming mating territories in river bottoms, and can be seen patrolling in lazy circles, chasing passers-by. The earliest flowers, such as some manzanitas and willows, draw honeybees as well as native bees, which are extremely variable in size and color. Small longhorn bees, iridescent mason bees, and early bumblebee queens all can be seen at these blooms during sunny spells. Most remarkable, however, is a phenomenon that is barely noticeable. Astute observers will see a proliferation of spider silk blowing in the sunlight, and near cliffs and canyons these pieces of silk might be extremely abundant, lofting in the wind. These pieces of silk are actually ‘balloons’ created by young spiders, who use them to catch upward breezes and disperse over vast distances. In fact, many will loft up to a thin band of the atmosphere called the Aeolian Zone, which wavers around 25,000 feet in altitude. This largely unstudied region is populated by pollen grains, fungal spores, and very small insects, all of which might be able to cross vast distances once they’ve reached this relatively stable atmospheric zone . February can bring amazing storms, and holds the record for both the highest rainfall in a 24-hour period and the third most snowfall in a month. On the other hand, February’s precipitation is extremely variable and difficult to predict, with as many as one in ten years receiving no or nearly no rain or snow. This is especially true in years that are dramatically outside the norm, such as the last four years have been—2017, 2016, 2015, and 2014 were the 1st, 2nd, 3rd and 4th warmest years ever recorded (respectively). This warming trend, which has increased Prescott temperatures an average of 2.5 degrees over the last 80 or so years, makes forecasting nearly impossible, and disrupts precipitation patterns. A wet February can by itself usher in a glorious, flowering spring, while a dry one when there is no other snowpack can herald low fuel-moisture and high fire-danger. In the high desert, such as the Mogollon Highlands, the abundance and distribution of water is the single greatest predictor of all activity in the Wilds. Ravens begin nesting and laying eggs. Yearling ravens have spent the winter in communal roosts, and can be seen flying in large numbers, but these flocks begin to break up now as breeding pairs form. Northern alpine birds, including red crossbills and pine siskins, move into this area during extreme cold to the north. These finches follow the seed-crop of coniferous trees, including douglas fir, white fir, spruces and pines. Visit: Spruce Mountain Loop, Trail No. 65. 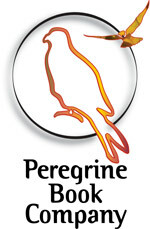 Peregrine falcons return to our area from Central and South America to reoccupy nest sites. Most peregrines are monogamous from year to year, with both partners migrating independently back to previous nest sites, and beginning courting and mating once there. This species is named for its extraordinary migrations, which can lead some individuals to migrate from Chile to Greenland. Abert’s squirrels chew off the tips of growing Ponderosa branches to reach the inner bark, or cambium. This is an important food source for this rare squirrel during the late winter after they have depleted their other food stores, but they also perform a vital service to ponderosas. Ponderosas rely on a symbiotic root fungus to break down soil nutrients, and Abert’s squirrels carry this fungus in their feces, transporting its spores from tree to tree and thereby keeping forests healthy. Visit: Miller Creek Trail, No. 367. Townsend’s solitaires, relatives of the American robin, begin migrating north to their breeding grounds as far north as Alaska. Solitaires subsist largely on the last of juniper berries from last year’s crop while in their wintering ground. Sharp-shinned hawks, the smaller cousin of the Cooper’s hawk, begin migrating north through the Mogollon Highlands. These small hawks were once considered a threat to songbird populations, and so were hunted aggressively. Now “mesopredators” such as the sharp-shinned hawk are understood to foster biodiversity by preventing one species from outcompeting another, and studies have documented increases in prey species where these types of predators are found. One-seed, Utah, and Rocky Mountain juniper all release their pollen now, causing extraordinary allergies for many mammal species. Winter flocks of western scrub jays begin to break up, as jays form breeding pairs. Pronghorn begin giving birth after eight months of pregnancy. Young pronghorn are able to walk after only about an hour, and can outrun a human when they are several days old. Pronghorn typically give birth to twins who will remain in the center of their herd for several months. Toward the end of the month, broad-winged hawks such as rough-legged hawk, ferruginous hawk and Swainson’s hawk begin migrating north through the Mogollon Highlands, following the open grasslands where they can see rodents. 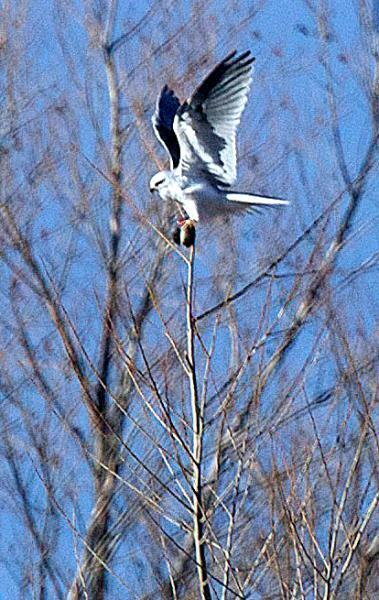 Many can be seen perching on power line posts during this time. Beavers, after consuming most of their winter stores, are very active in chewing away the inner bark of riparian trees. Their breeding season continues through this month. The earliest wildflowers begin appearing now, led by golden corydalis (Corydalis aurea). Coyote willow (Salix exigua) flowers and is mobbed by honeybees (Apis mellifera) for nectar and pollen. Honeybees are native to Europe and are unlike most of our native bees in that they are social and live in massive hives of up to 80,000 individuals. North America is home to roughly 4,000 species of native bees, most of whom are either solitary or seasonally social, and so remain inactive during the winter. Newborn river otters remain in their dens, and towards the end of the month will open their eyes for the first time. ‘Vagrant’ bird species (birds dramatically outside their range) can be found in and around our region’s lakes. Some of these birds have been blown by storms, while others are simply exploring potential habitat. These might include the common loon, Ross’s goose, tundra swan and extremely rare species such as the white-tailed kite.The first migratory songbirds, including spectacular breeding-plumage warblers, follow rivers and riparian corridors through our region to their breeding territories to the north. Flowering begins in earnest, starting with brittlebush (Encelia farinosa), which paints large swaths of the desert bright yellow. Some species of verbenas and anemones, as well as desert marigolds (Baileya multiradiata), begin flowering at lower densities. In some pockets, manzanitas begin flowering. Butterflies begin flying now, including the small Sara orangetip (Anthocaris sara) and the tiny spring azure (Celastrina ladon), both of which can be seen at patches of wet mud, seeking out minerals and nutrients. 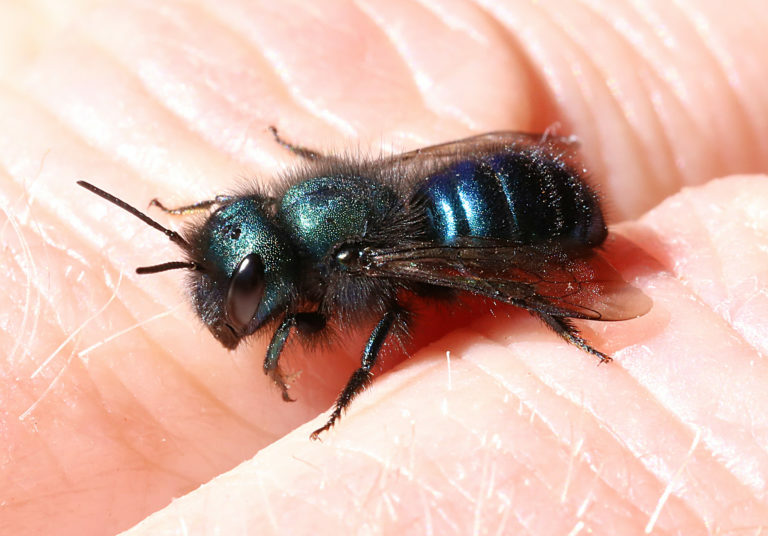 Native bees begin to emerge from their soil or wood nests to pollinate the earliest flowers. Arguably, the most dazzling is the iridescent blue manzanita mason bee (Osmia ribifloris), our most important manzanita pollinator, which flies on warm days. Feb.4th—New Moon at 2:03 pm. Feb.19th—Full Moon at 10:53 am. Feb.27th—Mercury at Greatest Eastern Elongation. The small planet closest to the Sun will be at its highest now in the evening sky, after the Sun has set. Astronomical Highlight. When the skies are at their darkest early this month, our nearest galactic neighbor, the Andromeda Galaxy, is visible with the unaided eye. Look for the galaxy as a smear of light next to Andromeda’s knee, to the northwest after twilight, or using a more direct method, draw a line between the two highest stars in Cassiopeia—Segin and Ruchbah— and the brightest star in Andromeda, Alpheratz (her head in most drawings), and then look for the galaxy two-thirds of the way from Ruchbah to Alpheratz. The Andromeda Galaxy, which is the furthest object that can be seen with the naked eye, at 2.5 million light years away, is very slowly headed our way, and will collide with our galaxy, the Milky Way, in 5 billion years, after our sun has turned into a red giant and consumed the Earth.